When you hear the word ‘lithium’, what do you think of? Maybe it reminds you of a Nirvana song. Or perhaps you know lithium as one of three elements that comprised the universe when it first formed billions of years ago. Lithium, a trace mineral your body requires, is all these things and so much more. Today’s 7-Up no longer contains lithium, but we can still find low levels of this vital and mood-balancing nutrient in our food and water. It gets into our food and water because it occurs naturally in soil and stones around the world. While most people associate lithium with brain health, you may not understand the many ways it helps. The mineral can boost gray matter in the prefrontal cortex region of the brain — the part associated with emotion, thought, and personality — in otherwise healthy individuals, as well as white matter.Researchers suggested that lithium does this by stimulating the brain to generate new stem cells, which then develop into neurons. The jury’s out, but research does demonstrate lithium’s ability to protect the brain from normal wear and tear (neuroprotection) and to discourage normal age-related brain shrinkage. The effects of calcium and phosphorus, two minerals integral to bone formation, may be enhanced through lithium supplementation. Some research indicates lithium’s potential to support bone strength. Lithium appears to decrease the risk of bone fractures. Other studies have found that lithium chloride salt helped bone fractures heal by activating the “Wnt signaling pathway” — a way the body communicates to repair damaged tissues, including bone. However, the scientists only observed this healing effect once a fracture occurs. Lithium chloride also helped damaged cartilage heal. Lithium may have antioxidant properties known to provide anti-aging benefits that improve longevity. 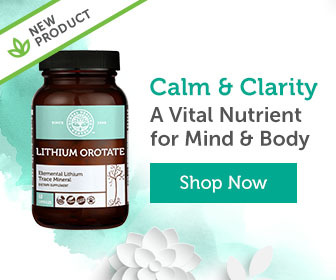 Specifically, lithium reduced damaging free radicals in the hippocampus part of the brain, though the study suggested the mineral can’t completely counter the impacts of chronic stress. Lithium may boost heart and cardiovascular health in surprising ways. One study found that the electrocardiograms of people who took lithium had lower “T wave amplitude” — an indicator of heart attacks — without any decline in heart function. However, this was at a relatively high therapeutic dose of lithium carbonate, which is only available in prescription form. Early research also shows that lithium boosts the body’s production of VEGF (Vascular Endothelial Growth Factor), a protein that helps your body form new blood vessels. When new neurons grow, it improves your focus, memory and cognitive function (“thinking skills”). The authors suggest this may account for the gray matter boost seen in some studies. Studies have also shown a boost in neural stem cells, undifferentiated cells that will eventually grow into neurons. Promising research shows that lithium orotate is an effective remedy for headaches. One study gave 64 patients lithium orotate and concluded that it’s effective for occasional headaches. Lithium is also known to help hypnic or “alarm clock headaches” which often affect the elderly, waking them from sleep at the same time each night. Those occasional, nightly headaches otherwise disrupt circadian rhythms and take away from restful sleep. The authors suggest that lithium may positively influence serotonin in the body, which promotes sleep. Make no mistake, if you’re battling alcoholism or drug addiction, get help. But, for people getting support for quitting drinking, lithium may help them stay the course. Lithium is naturally present in soil and groundwater around the world. Because of this, plants absorb the mineral by taking it up through the roots. Although “your mileage may vary” — because the amount of lithium found in plants depends on the soil in which it was grown — the options below typically contain higher amounts of this nutrient. Lithium’s neuroprotective benefits discourage brain shrinkage, thus reducing your risk of age-related diseases. It is also known to boost thinking skills (“cognitive function”) and strengthen your ability to focus. In individuals in recovery for alcoholism, lithium may reduce cravings for the drink. As researchers continue to study the benefits and side effects of lithium, we will learn more about this trace mineral’s considerable potential for improving health and well-being.